More than 40 years after her death, Ruth Crawford Seeger continued to be recognised for her talents and contributions to American music of the Twentieth Century. This critical article by William Zagorski accompanied the ad below in Musical Heritage Review, Vol 17, No 17, 1994 Release 503. This recording deserves landmark status not only because it illuminates a comparatively unknown corner of the American repertoire (and does so extraordinarily well), but because Ruth Crawford Seeger is such an interesting and provocative musician. The unerring precision of her craftsmanship alone would earn her the most honorable of honorable mentions. Given her highly original powers of invention, she is a musical voice to reckon with. Folk music aficionados are familiar with the Seeger name. Mike and Peggy Seeger are her children; Pete Seeger her stepson. She is the author of two informative and eloquent (and still popular) collections of folk music for children. In the 1930s she and her husband, Charles Seeger, contributed countless settings of American folk music to the collections of John and Alan Lomax, and transcribed thousands of field recordings for the American folk song archive of the Library of Congress. The roots of her own musical compositions, however, are to be found in the international avant-garde movement of the early part of our century. Born in East Liverpool, Ohio, in 1901, the daughter and granddaughter of ministers whose ambulatory careers eventually took her to Jacksonville, Florida, she obtained a solid background in piano. In 1921 she entered the American Conservatory of Chicago in order to study composition, and became a member of a musical circle that included Henry Cowell, Dane Rudhyar, and Edgard Varese. She also befriended Carl Sandburg, who encouraged her poetry (an early passion of hers) and provided texts for many of her vocal compositions. Her early works won critical acclaim. 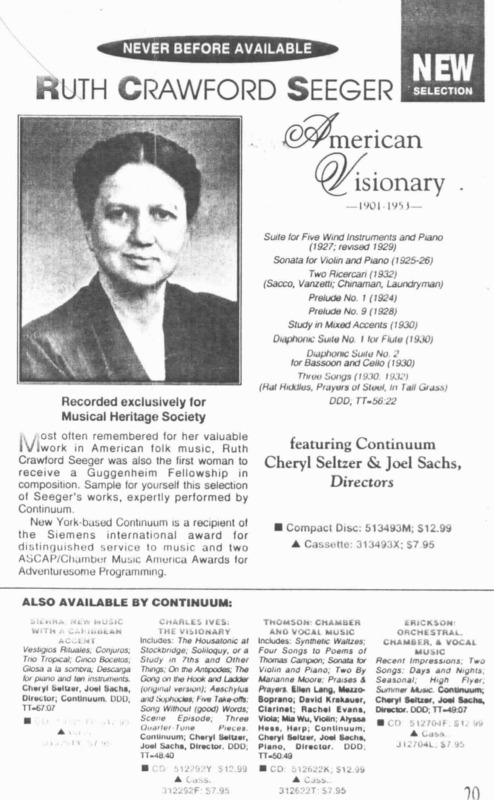 In 1929 her Piano Preludes were published in Henry Cowell's influential New Music Edition; she became a pupil of Cowell's former composition teacher (and specialist in ethnomusicology) Charles Seeger; and was the first woman to receive a Guggenheim Fellowship in composition, which enabled her to travel abroad. Her reputation preceded her and she was warmly received by such twentieth-century giants as Berg, Bartok, Honegger, Roussel, and Boulanger. Upon returning to tho United States she married Seeger. They set up a household in New York and founded a veritable folk music dynasty. During the Depression the Seegers participated in the founding of the Composers' Collective, and Ruth Crawford Seeger's Two Ricercari: Sacco, Vanzetti and Chinaman, Laundryman of 1932, which deliver their impassioned texts via Sprechstimme supported by a convoluted piano line, were composed for a Composers' Collective concert. In her Three Songs (1930, 193.") on texts by Carl Sandburg, the vocalist is a member of a "concertante" group consisting of oboe, percussion, and piano accompanied by a spatially remote "ostinato" orchestra consisting of thirteen additional players. Seeger was an inveterate experimenter. Though her earliest works (including the 1926 Sonata for Violin and Piano) occasionally betray their impressionistic, almost Scriabinesque, roots, by the time of her 1921 Suite for Five Wind Instruments and Piano, one encounters a fundamental rethinking of harmony and instrumental sonority. Her language becomes pithier and more direct and in subsequent works such avant-garde techniques as serialism, tone clusters, rhythmic independence of parts, and spatial separation of performers become fully integrated musical tools. This release is typical of Continuum - an expert and committed ensemble that has already distinguished itself on numerous Society recordings of twentieth-century repertoire. Underwritten by an NEA grant and by the Mary Flagler Cary Charitable Trust, it demonstrates, in addition to its other virtues, vivid, state et the art sound – all placed at the service of an undersung, and inimitable American visionary.